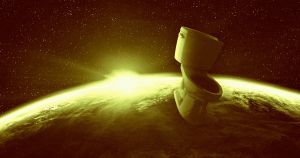 Russian media is reporting that the American toilet on the International Space Station (ISS) burst late last week, spilling gallons of fluid that astronauts had to catch with towels. Sure, it sounds like a story about an exceptionally bad roommate — but it might also be the latest escalation in the deterioration of relations between Russia and the U.S. in space, lending grim gravitas to the plumbing snafu. A source told Sputnik News, which is closely affiliated with the Russian government, that the toilet in the U.S. section of the ISS malfunctioned on Friday, spilling water into the microgravity environment. Water is a precious resource on the ISS, where filtration systems recycle shower water, sweat, and urine. Though it sounds silly, the leak underscores a worrying decline in relations between Russia and the U.S. — not just down here on Earth, but in space as well. This past summer, when a small hole was discovered in the ISS, Russian authorities suggested that it could have been sabotage. And that means that any new international friction in space, even when it’s seemingly gross and minor, is cause for concern.